Two Oakland wine bars — The Barrel Room and Downtown Wine Merchants — bring more to the table than just bread and cheese. 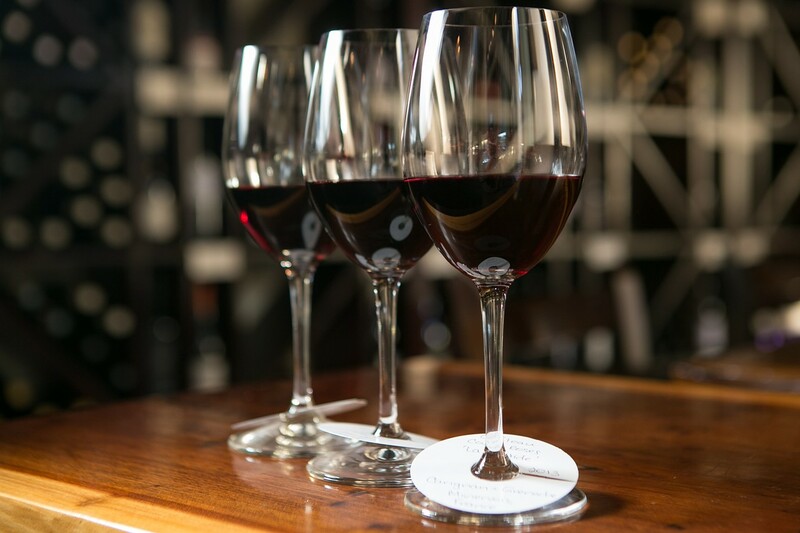 The Barrel Room's current wine and food theme is "French Classics." Hours: Mon.-Fri. 11:30 a.m.-9 p.m., Sat. 3-9 p.m. The wine bar, that signpost of turn-of-the-millennium American food culture, tends to get overlooked in the face of craft beer, cocktails, and ever-fancier takes on deep-fried bar snacks. Folks still drink plenty of wine, of course, but that old Italian model of soaking up your vino with nothing more elaborate than bread, cheese, and a small selection of cured meats mostly doesn't cut it anymore. In Oakland, today's wine bars might make a name for themselves by hosting a trendy pop-up (e.g. Ordinaire) or by morphing into a full-service vegetarian restaurant (e.g. Encuentro). Two of the city's newer wine bars, The Barrel Room and Downtown Wine Merchants, are almost old-fashioned in their determination to bring good wine to the people without any particular concern for current dining trends. Nevertheless, you can find delicious food at both establishments. In Rockridge, The Barrel Room is sleek, cozy, and, if you go with the right company, downright romantic. The interior is all dim lighting and dark wood, like a wealthy person's library — if the library's shelves were lined with wine bottles instead of books. Mostly, though, the year-old College Avenue outpost of the original Barrel Room (in San Francisco) sets itself apart with the unique model that owners Sarah Trubnick and Carolyn Johnson have devised: Every three months, the wine bar completely revamps its fifty-bottle, by-the-glass wine inventory around a different, often regionally specific, theme. Right now the theme is "French Classics," so the list is all Burgundies, Bordeaux, and a variety of other, more obscure French varietals. What's more ambitious, though, is that The Barrel Room is also a full-service restaurant, so the food menu is built up from scratch each time to match the theme of the wines. It's a little like opening a brand new restaurant every few months — exciting, but also slightly crazy. If the current menu is representative, though, then chef Manuel Hewitt is up to the task. Nearly every dish I tried was an unqualified success. Airy sweet potato croquettes were paired brilliantly with a garlicky aioli that helped balance out the sweetness of the dish. 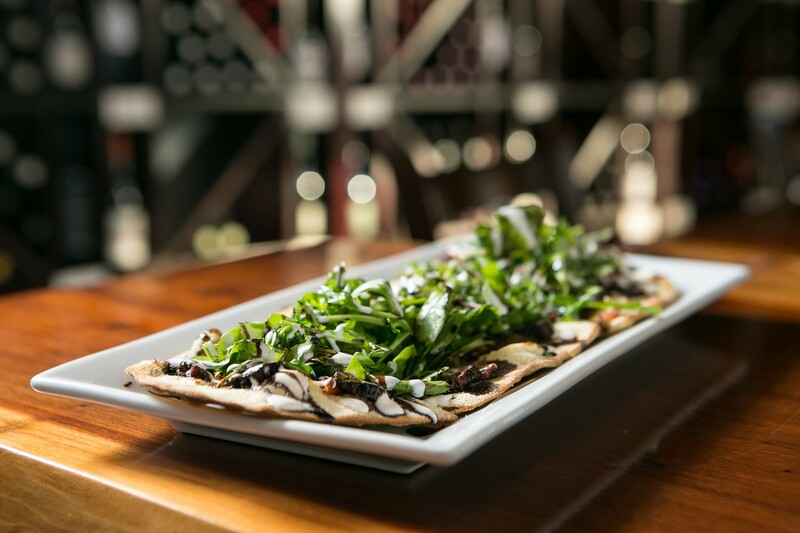 The tarte flambée (a kind of flatbread pizza) was topped with a fig spread, tangy fromage blanc, bacon lardons, and well-dressed arugula — a wonderful balance of flavors, and generously portioned for sharing. Endive au gratin was satisfyingly oozy and rich, studded with more of those bacon lardons to add a meaty, savory element. 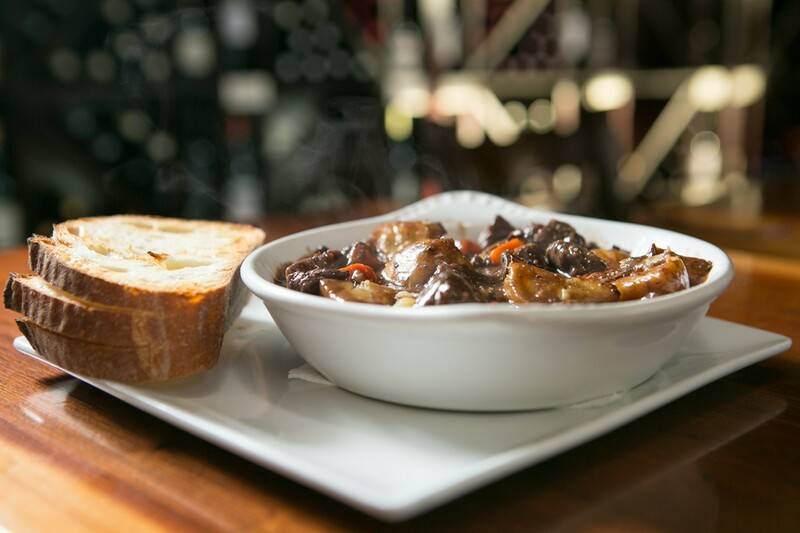 Hewitt's take on beef bourguignon, perhaps the biggest French classic of all, hit all of the dish's high notes: the tenderness of the beef, the natural sweetness of the carrots and potatoes, and the velvety texture of the sauce — so delicious when scooped up with a hunk of rustic bread. For drinks, I bypassed the labyrinthine task of navigating a list of fifty unfamiliar wines by the glass. To be honest, the only downside to The Barrel Room is that the wines tend to be fairly expensive, with nothing under $11 or $12 a glass (and only a handful at that price point). That said, for around the same price as a single glass you can do a three-wine flight — of which there were nearly twenty on the menu, all French, all organized by region — which seems to be where the real value lies (especially if you split the flight with a friend, as I did). Let no one ever accuse me of being the kind of food writer who masquerades as a wine writer, but the flight of red wines from Southern France that I tried was fairly spectacular in the way it showed off the diversity of that wine-growing region, while also being just plain delicious — especially the final wine in the flight, which was made from a little-known grape varietal called a Négrette and which the sommelier described as having a bit of a "barnyard funk." It was the first time I tasted, and loved, a wine that reminded me of stinky cheese. In truth, the Barrel Room model is a smart one. The fact that the entire food and drink selection turns over gives customers a reason to return at least once every few months. And the menu's elusive nature also means that if you find something you love, you might come back a few times before it's gone for good. The French theme should stay on through around mid-April, at which point the restaurant will likely switch focus to South America and Mexico. After that, things could get wild. Trubnick said she's got a "wines of the ancient world" theme lined up, and another one on island wines. What will that mean for the food menu? I look forward to finding out. Downtown Wine Merchants falls more into the classic wine bar mold, with a food menu that's limited to small plates, so you might make a meal of, say, a bowl of mussels, panini, and a simple salad. Susanne Breen opened the wine bar last November in a corner spot on the first floor of the old Lionel Wilson Building — one of the most striking buildings in downtown Oakland, with its skinny, triangular "flatiron" shape. It shouldn't be any surprise that the wine list focuses on smaller, lesser known producers — all European and American — because, really, what would be the point of a wine bar that served wines everyone could just buy on their own? One of chef Edwin Cabrilla's fun offerings is the crostini bar, which he offers during the daily 3-to-6 p.m. happy hour. Though not quite as lavish as the image the term "crostini bar" conjured in my mind (I had visions of a kind of serve-yourself, mix-and-match fixings bar), the three-crostini-for-$7 deal is a decent value and ranked among the tastiest bites I had that evening, especially the tender pork confit and a tawny-port-infused chicken liver spread. Cabrilla explained that one of his challenges is that the wine bar doesn't have a full kitchen; in fact, the only cooking equipment is a combi oven (part convection oven, part steamer) and a panini press. That lack of a grill or a stove wound up being a hindrance to several dishes that would have benefited from a hot flame. Lamb chops adorned with a slurry of mint and Meyer lemon zest needed a harder sear than that of a quick stint on the panini press. While the meat was juicy enough, the texture was all flabby and soft, with none of the well-browned exterior crust that gives grilled meat its depth of flavor. The same was true of the cumin-and-paprika-dusted Andalusian chicken skewers, though mainly I just wanted those to be more aggressively spiced. Had I known about the kitchen's limitations, I would have ordered differently. I would have tried one of the flatbreads, for instance, or the escargots in prosciutto-garlic butter — the kinds of dishes that put their best foot forward when baked in a hot oven. The menu is more successful when it veers away from its predictable rehashing of the European small plates oeuvre toward a more personal kind of expression. My favorite dish was the käsespätzle, a baked pasta that Cabrilla explained was a favorite of Breen's from her childhood in Germany. Like an elegant mac 'n' cheese, the thin, twisty spätzle came in a hot ramekin, fragrant with the sweet smell of caramelized onions, and the top layer of the melted cheeses (gruyere and Emmentaler) and pasta had browned and crisped up beautifully. The resulting spätzle — which, undeterred by the lack of a stove, just cooked in the sauce while baking — was equal parts crunchy and chewy, infused with the soul of French onion soup. And the crème brûlée I ate for dessert had been spiked with elderflower cordial — another nod to Germany — adding a floral note that was a refreshing counterpoint to the smoky burnt-caramel flavors. 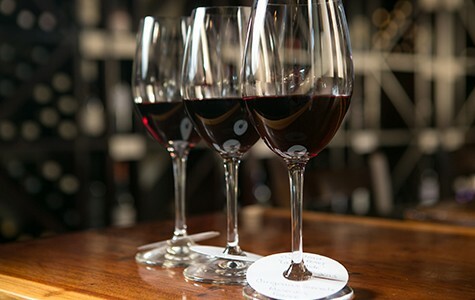 In the end, Downtown Wine Merchants' biggest virtue is its location right in the heart of downtown, which means that a bulk of its business consists of office workers stopping in for a bite and a glass of wine during their lunch break or to decompress before they head home. The space is bright and lively, and during happy hour, the $6 wines by the glass were the quintessence of smooth, easy drinking. There are worse ways to while away a couple of hours.